I haven't colored anything in a long time and so I tried my hand at it again. I quite like this one. There are vaguely pornographic advertisements on the top of the links, so I'd suggest maybe we go ahead and copy the link to the images themselves and not the page with the images. Know what I mean? Romanov and Imperial Russia Links / Re: Has Livadia.org been updated? I haven't worked on it in a few years. I was considering trying to get the other sites back up and running, well, at least keep them updated but honestly I felt little need once tons of sites about the family and the girls (often with my scanned photos or colorized photos with no credit) kept popping up. Kali and I both have lives and have kind of moved on from the Imperial Family. But I'm not doing much except applying to graduate schools, so I've been considering it. If people have any interest in me keeping up a site though I'd bring TRW back or something, I am just not sure what interesting content I could provide considering so much is out there now. So yeah. If anyone has requests, PM me, email me, Facebook me, whatever. Lovely, you guys! I haven't colorized any photos in awhile but I am thinking of getting back into it. Alenka, how do you get the hair colors so nice and different from one another? I always had a problem with that. What programs do y'all use? It looks like the technique I used 6, 7 years ago is way out of date! Just dropping by to say so. Having Fun! / Re: How is everyone today? Just thought I'd say hello as I'm bored and lurking around. HI. Olga Nicholaievna / Re: Olga born late? Not a lot. Usually women just suffered through. Queen Victoria used chloroform for some of her children but I am sure it was not considered acceptable. I've never heard of Alexandra using chloroform during labor. Olga was probably not "late" as we count 42 weeks (full term!) as "late". Thanks, everyone, for alerting this to me. I'm visiting at home so the forum loads! There has still been no response. I'm excited about the diary but upset that GRB, from whom I've bought lots and lots of books, did something this unprofessional (and perhaps illegal). And it wasn't even a good picture! You'd think they'd pick a better one! The picture KarlandZita posted of Tatiana was taken at Stavka; there are similar pictures of her, Dmitri Pavlovich and Nicholas. There's nothing you guys can do. When some jerk was selling my pictures on eBay and making money off of them, or my scans, I couldn't get eBay to stop them and they legally should have. This is just typical internet theft. Considering it's just some dinky website, don't even worry about it. Get angry if people take your colorized photos and make a profit from them. This person is obviously an idiot, because the black and white images are all public property regarding copyright. However, the colorized photos are modified public property and therefore the colorizer's (I made up a word!) creative property. Again, there's nothing you can do about it if she's not selling them. Obviously she just took them from the website here; she's certainly not clever enough to get rid of the website title on the images, at least. Moron. Having Fun! / Re: How do people respond to your Romanov "fanaticness?" But, my History Teacher said nothing special about the political system of Nicholas II (or Alexander III due to her mistake lol) . She only learned us when he abdicated. But nothing more about him. (nor his family). I think it's important when we study the Russian Revolution to learn what happened to the Last Tsar. She just talked about Kerensky and his government a little. She didn't even mention the name of Kerensky. That's what that didn't really please me. I don't think a lot of people think it's important, except there was a revolution so to speak, a Provisional Government, they died, Lenin took over, and so on and so forth. I got a very vague understanding of it in AP European History in high school and now as an adult I still don't know all of the particulars and when what happened, etc. The socio-economic and political issues of the time are way more important than Romanov trivia, basically! If Marie is No. 5 and Tatiana is No. 6 ~ then the height for No. 6 is wrong. If Tatiana is No. 5 and Maria is No. 6 ~ then the height for No. 6 is wrong. If Tatiana is No. 5 and Anastasia is No. 6 ~ then the height for No. 6 is wrong. If Anastasia is No. 5 and Tatiana is No. 6 ~ then both heights are wrong. Is Maria is No. 5 and Anastasia is No. 6 ~ then the height for No. 6 is wrong. If Anastasia is No. 5 and Maria is No. 6 ~ then both heights are wrong. I also think this is an issue of who's your "favorite". A lot of the people who love Anastasia will say, She was missing! 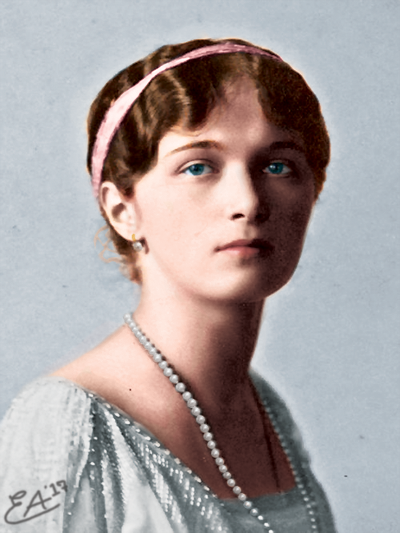 Those who like Maria will be more likely to say, No, it was Maria Nikolaevna! Well, yes, that is wrong, but quite frankly in history classes in high school are about the big picture. Knowing the names of Nicholas II's kids is not important. You should know why things happened, why the Revolution happened, why they were executed (though there's lots of different 'schools of history' so to speak on that), etc. Getting into the details isn't important for a beginning history education where most people just don't really care one way or the other. You've got to get the big picture first before getting to the nitty-gritty or else you go farther down the line and nothing makes sense. When I was in high school I'd get mad that we didn't cover stuff I found interesting but as I got older I realized it was insignificant. My AP European History teacher called Alexei Alexander, said Rasputin and Alexandra were lovers, etc. I'd correct him. But he got all the big issues right: what importance the Romanovs have in the historical timeline, more focus on the Revolution because it was such a big social event everyone was freaking out about, etceter.